The continuing popularity of succulent plants is based on several kinds of appeal, beginning with drought tolerance and including interesting shapes and an amazing range of colors. This diversity occurs because plants in many genera have developed the capacity to store water in their roots, stems or leaves. Their common characteristic is that they live in areas where drought conditions happen often enough to make water storage essential to survival. Succulent plants have a reputation for being easy to cultivate, relative to other perennial plants. In addition to needing water only occasionally and in small amounts, these plants are have few problems from pests and diseases. The native environment of a succulent plant can be important to its cultivation. Most gardeners know that succulents need fast-draining soil to avoid root rot, and grow well, if slowly, in nutrient-poor soil. These plants have evolved under such conditions, and now depend upon them. Another consideration is the elevation of the plant’s native environment. Succulent plants that have evolved on mountains are accustomed to those environmental conditions, and could have unique leaf anatomy and photosynthetic characteristics. Good gardening practice often involves matching—or approximating—the plant’s native environment, but changing the elevation of one’s garden is not among the options. Happily, most succulent plants from high elevations can grow well at lower elevations. Succulent plants grow in many areas of the world, and an important issue of native environment is the hemisphere in which the plant evolved. This determines the plant’s dormancy, which influences the gardener’s cultivation practices. they rest from November through February and grow from March through October. again in September and October. Popular succulent genera that are Winter Dormant include Agave, Echeveria, Euphorbia, Lithops and Pachypodium. Succulent plants that have adapted to the southern hemisphere are Summer Dormant, which also means that they are winter growers. Their rest period continues from May through August; they grow slowly during the winter months, and then grow actively during autumn and spring. Examples of Summer Dormant succulent plants include these popular genera: Aeonium, Aloe, Cotyledon, Crassula, Dudleya, Gasteria, Graptopetalum, Haworthia, Kalanchoe, Pelargonium, Sanseveria, Sedum and Senecio. The gardener should avoid disturbing succulent plants during their dormant periods. So, repotting, pruning, or taking cuttings should be done in March for Winter Dormant plants and in August for Summer Dormant plants. Watering succulent plants is another practice that is dormancy-related. When plants are dormant, they stop growing but continue to transpire, and therefore need replacement moisture. Not watering succulent plants while they dormant is the most common cause for failure. The amount of moisture needed during dormancy depends on the dryness of the particular environment. Winter Dormant plants might need watering once or twice per week. Summer Dormian plants, which rest during the hottest time of the year, could need more frequent watering. Also, remember to group plants with similar water needs. 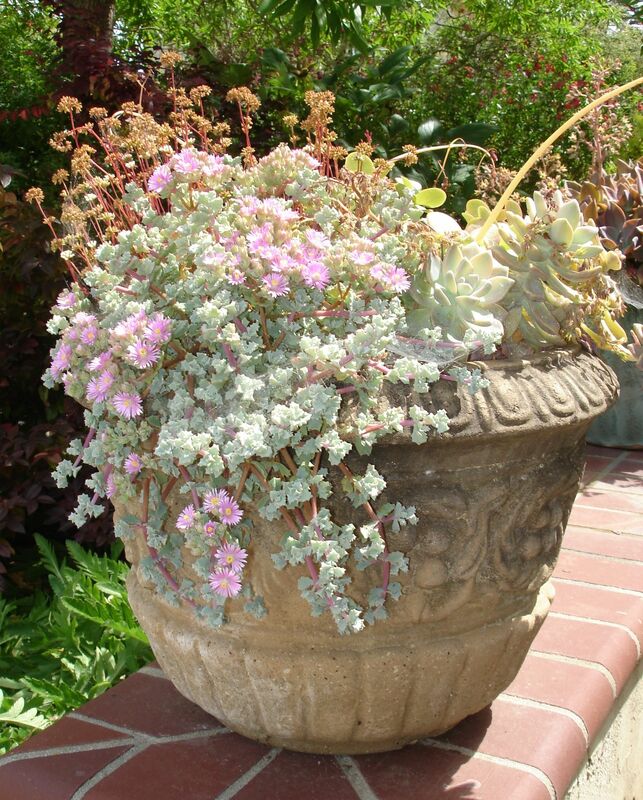 Such grouping can be important when combining succulent plants in containers: keeping Summer Dormant or Winter Dormant plants together will enable more convenient and more appropriate irrigation. These guidelines could need adjustment for individual species; as always with the plant world, general rules are subject to variation. This entry was posted in Essays 2014, Fall Quarter and tagged containers, Cultivation, low maintenance, succulents by tomkarwin. Bookmark the permalink.